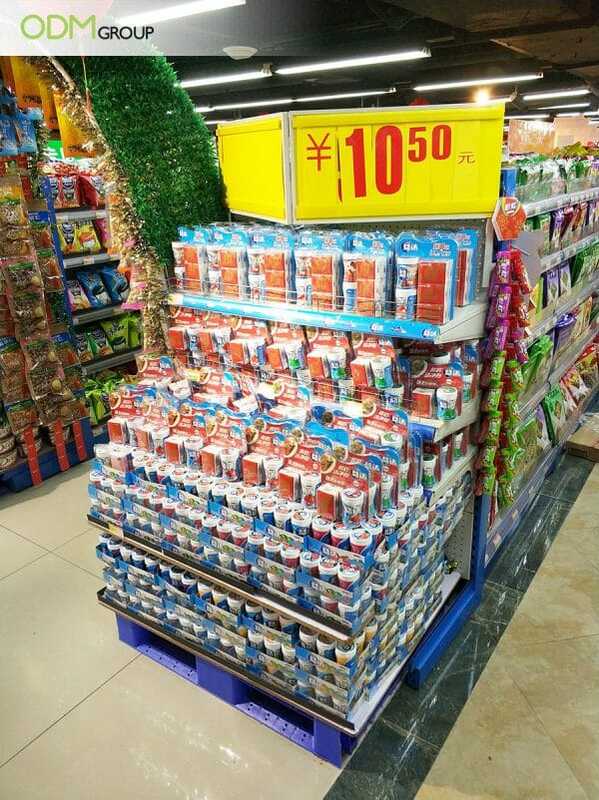 We recently spotted Wrigley’s unique Gondola End Cap Display at a Chinese supermarket. This display stores Wrigley’s promotional flavored herbal extracts. The display maximizes space by storing many Wrigley’s products and appeals to shoppers with an added gift with purchase. Why Is Wigley’s product appealing? Colorful packaging: This attracts customer attention, makes potential shoppers want to view the product. The plastic packaging does the talking, therefore the Gondola End cap display is simple in design. It utilizes existing end aisle space and shelving. It resonates with Chinese shoppers– Customers will get 6 pieces of pocket napkins as gift with purchase. And you can see that the packaging features a red Chinese lantern, which resonates deeply with the Chinese culture. This is a fortunate color in China, and therefore a smart move to attract the local market. Promotional items are also incentives to drive sales. 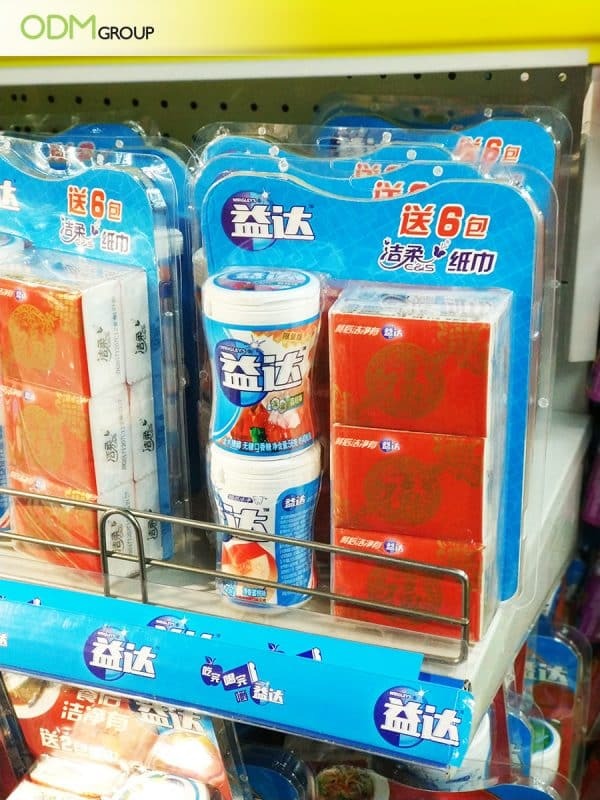 Wrigley’s uses red to try and associate themselves with good fortune among Chinese consumers. Another example, Ferrero’s POS display reflects Chinese culture well because it uses the same red color with the large custom Chinese red pockets or custom money envelopes. It uses the famous local Tangerine trees and replaces the fruit with Ferrero Chocolates. It’s a neat way to link their product to the Chinese market. Practical Value: Tissue paper marketing works well with Wrigley’s because of its practical value. Customers can then use the napkins to collect and wrap their chewed gum. Not only does the on pack offer reminds people to mind proper hygiene, but it also makes it easy to dispose off the gum. The box packaging fits well with the existing store Gondola display. This means the shelf was custom-fitted to the size of the boxes. Speaking of packaging boxes, ODM have various environmentally friendly plastics or bio pet packaging similar to Wrigley’s packaging. The Gondola end display is dedicated to Wrigley’s product- this makes the gum products exclusive to Wrigley’s which is one way to drive sales. Its display doesn’t have a large print or expensive display items- The product’s packaging does the marketing as discussed earlier. Keeping it simple directs the attention of shoppers to the products, thereby making a solid impact on customers’ mind. Wrigley’s uses effective packaging and design to convey promotional items. Where these products can be displayed on different shelves without the need for custom display units. There are other times when this is necessary as discussed for different products, require different POS display stand needs. ODM have extensive knowledge in developing Gondola End Displays to suit your marketing campaign. Don’t hesitate to inquire with us today to find out more. Eleva has gained a massive sales increase with this large plastic print display. Out in a Hong Kong shopping market like Wrigley’s it uses color to create an eye-catching in-store display. It has a custom display stand using LED light to emphasize key information about the brand. It’s one of the best retail display ideas case studies in our blog. High-end products have different needs such as this freestanding wine display. This gondola end display by Line at a 7-11 store is one of the best we’ve seen thus far. The colorful mobile app merchandise were displayed neatly on the end cap complete with posters and shelf talkers.